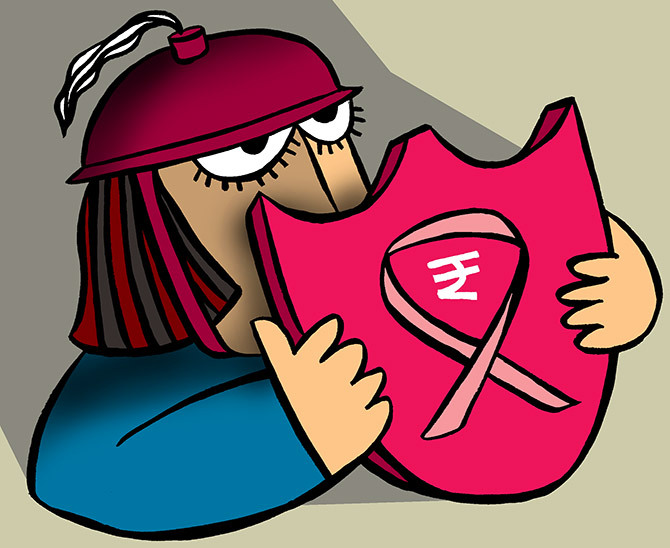 Rediff.com » Business » 6 reasons you must buy cancer insurance NOW! 6 reasons you must buy cancer insurance NOW! 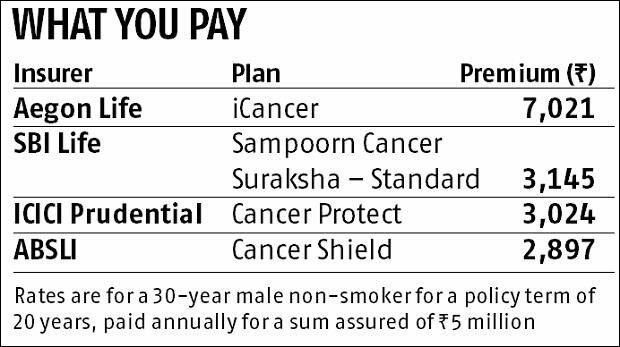 'Given the high cost of treating cancer and the reasonable premium rates at which these plans are available, one should opt for a cover at the earliest,' says Mahavir Chopra. Cancer strikes fear in even the most strong-willed. As people embrace more fast-paced and unhealthy lifestyles, the incidence of this disease is set to increase. According to projections by the Indian Council of Medical Research, India is likely to have over 880,000 cancer-related deaths and over 1.73 million new cancer cases by 2020. Besides the gravity of the illness, it is the financial cost that exacts a heavy toll on the victim's family. A cancer policy has the potential to soften the financial blow in case the disease strikes. The story of a departed friend comes to mind. He had purchased both a term plan and a mediclaim policy and thought he had fulfilled all his responsibilities as far as buying protection goes. Then one day, he was diagnosed with blood cancer. His family struggled to meet the treatment expenses. The cost of chemotherapy sessions ran into hundreds of thousands of rupees, and they were not covered by his mediclaim policy since it is a pre-hospitalisation treatment. His family was forced to sell their house to cover the massive treatment costs. Purchasing a standalone cancer plan could have made all the difference in his case. A cancer plan pays the insured a fixed amount, which is a percentage of the sum assured, on diagnosis of cancer. The payout depends on the stage of cancer the person is diagnosed with. No sub-limits apply here, as is the case in many health insurance plans. The entire cover is paid out on detection. Moreover, getting the claim does not require hospitalisation. This eliminates the hassle of applying for a cashless claim or running after the insurer for reimbursement after paying the expenses out of one's own pocket. The victim can focus on his treatment without worrying himself sick about the astronomical bills. Payouts from cancer plans can also become a substitute source of income as patients usually have to take a break from work due to the illness. Other than those covered in the table (below), some of the standalone cancer plans available are HDFC Life Cancer Care Plan, LIC Cancer Cover Plan and Max Life Cancer Insurance Plan. Generally, a cancer plan covers two to four stages of cancer: Carcinoma In Situ (CIS), early stage, major stage and critical stage. As far as payouts are concerned, insurers normally club the stages and make payments for the first two stages, Carcinoma In Situ (CIS) and early stage, in one payout and for the last two, major and critical, in the other. There are also plans that pay for all stages separately or pay for a combination of them. Next, let us turn to the additional benefits that cancer plans offer. All future premiums payable under the plan are waived off for a period of three or five years, or even for the entire policy duration, on acceptance of claim under the early or major stages of cancer. The policy continues with all its benefits intact. This feature proves to be quite useful as the insured is relieved from the burden of regular premium payments on being diagnosed with cancer. Under this benefit, the insurer pays a monthly income equivalent to 1 per cent of the chosen sum assured for a defined period, which is usually three to five years, on diagnosis of a major stage of cancer. Some insurers pay this benefit over and above the chosen sum assured, while others pay it out of the sum assured. This benefit payment continues even after the insured's death, for the remaining period. These payouts help the insured meet their day-to-day medical expenses. Insurers also offer the option of increasing the basic cover by 10 per cent every year till it becomes double the level the insured started with, or till the time a claim is made for an early or major stage of cancer. This again proves useful as the cover increases yearly and helps the insured keep pace with the rising cost of treatment. All the above benefits are either an intrinsic feature of cancer plans or customers have to opt for them separately by paying an additional charge. These plans are much cheaper than you would expect. To get an estimate, look at the table given above which offers the premium rates for a level sum assured plan of Rs 5 million for a 30 year old. The policy that you buy must have certain essential features. Ensure that it pays out a percentage of the sum assured on at least two stages of cancer -- early stage and major stage. Check the benefit that will be paid out at each stage and the combined total benefit the plan will pay. Before buying the plan, check whether the sum assured will remain fixed throughout the term or will increase every year up to a certain limit. The premium rates will be higher in case of a plan where the sum assured increases. You also need to find out whether the plan provides waiver of premiums upon diagnosis, and the duration and stage of cancer for which this benefit is provided. It is beneficial to opt for a plan that provides this benefit at an early stage itself and for a longer period. Next, check the survival and waiting periods applicable to the plan. It is best to go for a plan that has the lowest or no survival period along with minimum waiting period before the cover starts. Finally, check the duration or term of the policy. It is advisable to opt for a policy that provides a longer coverage period so that you are protected even in old age. These cancer insurance plans do not offer any maturity or death benefit. However, being specialised health insurance plans, they offer tax benefit of up to Rs 25,000 under Section 80D. You can also save both time and money (through a discount on premium) by purchasing this plan online. Given the high cost of treating cancer and the reasonable premium rates at which these plans are available, one should opt for a cover at the earliest.